A Sunflower Life: Wassail for a #SundaySupper Holiday Party! When I found out drinks and appetizers were on today's #SundaySupper menu, I immediately thought of my mom’s Wassail recipe. I grew up with the smell of it wafting through the house as Christmas approached and the weather turned colder. 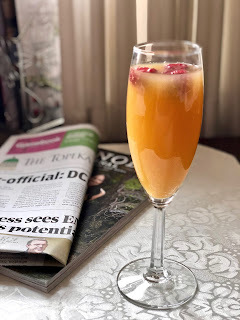 Then, after the sad events in Connecticut last Friday, it became clear that a warm, comforting drink and a little holiday cheer is what we all need about now. Those of you who read this blog on a regular basis know I am also a preschool teacher. What happened to those children and teachers hit me quite hard. I can just imagine the reaction my students would have to such a terrible, traumatic event. However, it is comforting to be able to share this family recipe with you, and to teach about its history. The word “wassail” comes from the late-21st century English toast “was-hail,” which means “be in good health.” To go wassailing was singing carols from door to door in hopes of a warm beverage and treats. The drink itself was a warm spiced ale or wine garnished with roasted apples. Mom’s wassail recipe is very simple. Just wrap the whole spices into a cheesecloth pouch and pop it into a pot full of apple cider and cranberry juice. (If you can’t find apple cider, just use apple juice.) You may need to add a little brown sugar depending on the sweetness of the juices. For a party, warm the wassail in a slow cooker and float a few apple rings and cinnamon sticks on the top. Mom never spiked hers, but I’ve found a bit of brandy dresses up this holiday drink. Not only is this a festive beverage, but it also helps you cope with the viruses and colds that float around this time of year. Leftovers can be stored in the refrigerator. Then, when the wassail craving strikes, just fill up a mug and warm it in the microwave. Enjoy a mug of wassail, and cheers to you this Christmas and throughout the holiday season! Cut a piece of cheesecloth and place the whole spices in the center. Pull up the edges to make a pouch and tie with butcher’s twine. Pour the cider and juice into a large pot or slow cooker. Add the spice pouch. Bring to a boil and simmer for 30 minutes. (Or heat in the slow cooker on low for 4 to 5 hours.) Before serving, taste for sweetness and add 1/2 cup brown sugar if necessary. Also, add the brandy for a more adult beverage. Check out the party creations from my fellow #SundaySupper bloggers, but please be aware that some of the participants decided to postpone their blog posts because of last Friday. Plus, there will not be a #SundaySupper chat this week. However, visit their blogs anyway. They are full of lovely recipes. I never even knew what wassail was but it sounds delicious! I need to make some over the holidays. Wassail always makes the house smell so good. Love making it. Spiked cider? Where do I sign up? You are right - some good cheer and tidings of comfort and joy are what the world needs now. This looks very heartening. Blessings to you and all the children close to your heart. I love hot apple cider and this is about 10 times better with the added ingredients. Yum! Thanks for sharing. I know we all will hold are kids a little tighter each and every night. I know there are terrific teachers like you who would give their lives for there babies in their classrooms. I think this is a fabulous recipe. Which I will share with all of my friend today. I have never tried wassail before, but your recipe sounds amazing! I am dying to have a cup now! I've had wassail never knew how to make it! I have never heard of this. I can just imagine the aroma, that would definitely be a great memory! Oh I can imagine this smells absolutely amazing. I could use a warm glass right now. I love this recipe!!!! Thanks for sharing. I never knew what wassailing meant so thanks for teaching me something new today. This sounds like Christmas in a cup! I can't even imagine the heartbreak of the families in the aftermath of Friday's tragedy. As a teacher, you must have felt the effects that much stronger, looking around at all the little ones in your classroom. Although I'm grateful for every moment I have with my family and friends all throughout the year, it's just a little sweeter to do so during Christmas-time. Thank you for sharing and happy holidays to you and your loved ones. I've never known what goes into Wassail, but it has always been on the list of things that just seemed very Christmas-y. I'm excited that it's so easy to make. And brandy makes everything better! Thanks for sharing! It is so worm and delicious! Love it! I love Wassail! This sounds wonderful! Ooh lovely ! I love all the spices ! yummmm ! What a festive drink! It looks really good.